Is the Reed Procedure ® covered by insurance? The Reed Procedure® is covered under many major medical insurance policies. Your insurance carrier will determine your level of benefits, based on your policy and medical history. 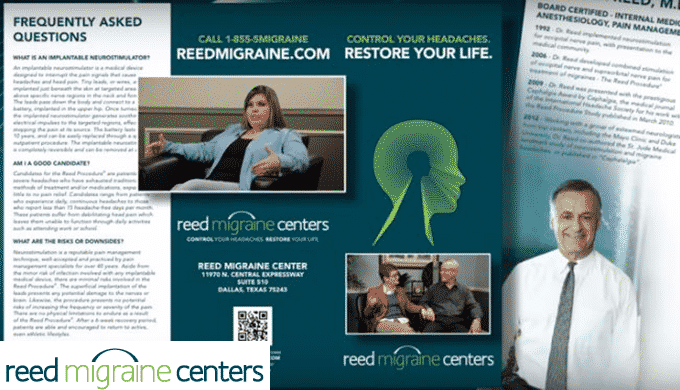 Reed Migraine Centers insurance specialists have over 25 years experience working successfully with all of the carriers with respect to verifying benefits and obtaining pre-certification for the Reed Procedure ®. We pride ourselves on complete transparency, and our specialists will keep you updated throughout the process. The key point is that you will have confirmation of insurance coverage prior to any procedures. We understand the insurance process can be frustrating and time-consuming. Our team will help to ensure you receive the maximum benefits available in a timely fashion by working directly with your insurance carrier on your behalf. If you qualify as a candidate, we will need your help to complete your pre-authorization. Our goal is to help you get relief from chronic, severe head pain as soon as possible. We will make every effort to provide insurance support that is quick and convenient. For insurance questions, please contact our office at (972) 707-2800 or after hours at (972) 922-1692. Note: Unfortunately, we are not able to accept Medicaid, VA, Tricare or Champus.